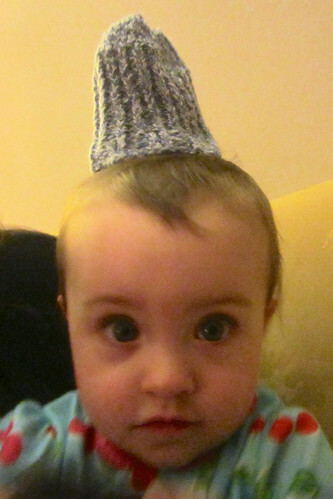 I learned how to knit almost a year ago, in June of 2012, a few weeks after my daughter was born. Rorie was born at 30 weeks, two-and-a-half months early. She was a tiny baby -- two-and-a-half pounds -- and as a result of her premature birth, she spent five weeks in the NICU before she was able to come home. Life in the NICU is often described as a roller coaster, in that it is full of ups and downs. Compared to the experiences many people have in the NICU, we were blessed with a relatively easy stay, but we did experience our share of setbacks, disappointment, anxiety, and all of the difficult emotions one encounters in a situation like this. We also experienced our share of milestones met, accomplishments, joy, pride, relief, and happy surprises. One of the highlights that will always stick with me was one of the NICU happy surprises. One night while we were sitting by Rorie's isolette watching her sleep, one of the nurses came by with a handful of tiny hand-knitted hats. They were made and donated to the hospital by volunteers who do such things. The nurse gave us a few of the hats and went along the hall, distributing hats to the other families who were in the NICU. Those hats were such a welcome gift to us. Not only were they practical -- they helped Rorie regulate her own temperature when we were holding her outside of her isolette -- but they were also whimsical and fun. They were full of color and really did a lot to brighten the atmosphere whenever Rorie was wearing one of them. As I looked at those hats, turning them over in my hand, I thought to myself that knitting hats like that was probably something I could learn how to do. I could almost see how the stitches were constructed, and I was sure that if I could get someone to show me how to knit, I would be able to make my own hats for Rorie. That was something I really wanted to do, because a lot of my time while she was in the NICU was spent feeling helpless and watching her sleep. I thought that if I could give her some hats, that would be something I could do to help. I found a simple hat pattern online -- the Preemie Stocking Cap pattern from Lion Brand Yarn -- and convinced my mother-in-law to teach me the basic stitches I needed to know to knit it. My wife had knitted scarves in the past, so we had some yarn around the house, and I found a skein that would work for a hat. After a little tutorial from my mother-in-law, I was off to the races. Knit two, purl two, knit two, purl two.... Get all the way to the end, turn it around, and do it again. After a few rows, I had a respectable band of ribbing on my needles and switched to the main portion of the hat. Knit one, purl one, knit one, purl one.... Turn it around. Knit one, purl one, knit one, purl one.... Turn it around. Repeat. And so on. Soon enough, it was tall enough. What is this "knit two together" that the pattern talks about? A quick demonstration from my mother-in-law, and I was decreasing. Soon enough, I'm done, with a triangle-ish looking thing hanging from a few stitches on one needle, curling over on the sides. How do I sew it together? Once again, another quick demonstration from my mother-in-law, and I'm sewing the seam together then weaving in my ends. Imagine my joy when I was holding in my hand a complete, finished, tiny hat, hand-made by me, just for my daughter. It was a day or two before we got a chance to put the hat on her head. And when we did, it barely fit (that's a good thing -- she was growing quickly! ), so she didn't get to wear it often before she completely outgrew it. But it really did make me very happy to look down at her in her isolette, wearing that hat. She seemed to like it, too. After finishing that hat, I was definitely addicted. Knitting is a perfect NICU activity. As a parent, I spent a lot of time in the NICU, pretty much actively doing nothing. Knitting helped pass that time. And what fun it is when a completed project comes off the needles. I kept up my knitting when Rorie came home and expanded to things other than hats. I knitted booties (that she only got to wear once before growing out of them). I knitted her a small teddy bear. I knitted more hats. 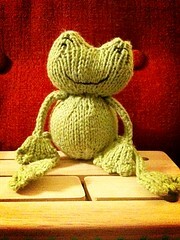 I knitted the cutest frog toy -- the body is stuffed with a tennis ball for added bounce and fun! I expanded my knitting audience to include hats for my wife and friends. I knitted geeky dishcloths for myself. I learned how to do simple lace work with a triangle shawl. I learned what blocking was, and how it magically makes something ugly look good. I dove into Elizabeth Zimmerman's Baby Surprise Jacket -- and loved it. Recently, one of my friends had a premature baby, so I immediately knew to go to my needles and whip them up a whimsical hat. I'm currently working on a cardigan for Rorie, and my wife has already put in orders for sweaters for herself. She has a good time going into my Ravelry account and adding projects she wants me to do to my queue. I've heard it said that knitting is good therapy. For me, it certainly is. I'm a software developer, and knitters are human computers. After a long day at the office, I love coming home, settling in my favorite chair, pulling out my needles and yarn, and getting a few more rows on whatever project I'm working on done. I can't knit fast enough -- there are so many projects I want to do, and just not enough time to do them. So I just keep adding them to my queue. Whenever I finish a project, I love going though my queue and picking out the next thing that is going to go on my needles. So from one NICU Dad, on behalf of NICU parents everywhere, to anyone who has ever knit and donated an item to the hospital for preemies -- thank you. Thank you so very much. I know you probably never get to see the recipient of your gift, that you never get to know just how meaningful a gift it is. I want you to know what a great joy it was to our family when we received those hats. I'll never know who knitted them, so I can't thank them personally. And in addition to bringing us some joy during our NICU stay, receiving those hats turned me into a knitter. We just celebrated Rorie's 1-year birthday and she's doing great. I pulled out the first hat I knitted for her almost a year ago and put it on her head to get a gauge of how far she's come. It's really hard to believe that her head used to fit in that. 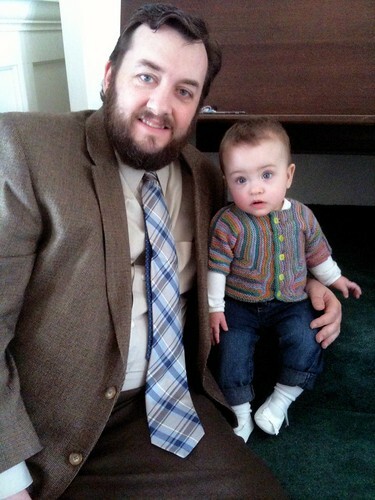 Greg Cohoon is a husband, father, knitter, worship leader, amateur theologian, musician, IT professional, amateur radio (ham) operator, geocacher, baseball fan, marathoner, novelist, and poet. He's drmellow on Ravelry and loves making new knitting friends. "Dr. Mellow's Knitting Origin Story" originally appeared on the With Hook In Hand blog as "Meet Greg Cohoon; Husband, Father, Knitter". Awesome. Wonderful. And I'm so glad. She is SO adorable, and the comparison between the preemie hat near birth and at 1 year shows how much she's grown. I love seeing all of your projects. Fantastic write-up. Grinned reading the whole way through.